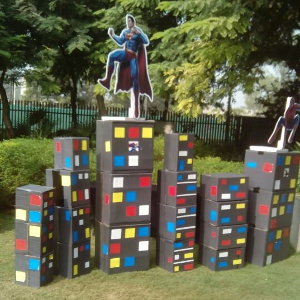 This impressive SUPERMAN THEMED BIRTHDAY PARTY was submitted by Birthday Planner Delhi This will gonna such a fabulous party! I love all of the fun Superman ideas, for instance, the cute superman suckers, cake toppings, and poop’s push. This party would work dramatically daring for a little boy who loves Clark Kent and his Superman kind adventures. 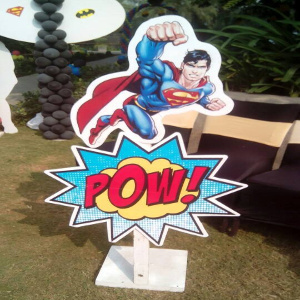 Superman Theme Party Decoration. The colourful cake layered with push pop containers. Superman Theme Party Planner. The glass milk bottles wrapped within Superman labels for drinking purpose. The cute little fabric Superheros. The stunning levelled Superman cake. The blue cake poppings adorned with the Superman’s logo . Superman Theme Party In Delhi. Guests will start thinking about your superpower is party planning! You won’t need a cape of Good Hope to be powerful enough to throw a great party, Just you have to call or choose our Superman themed party supplies for deluxe all-in-one packages full of party. Superman Theme Party In Delhi. Special care should be involved in the planning just when the right uniform to ward off of the evil from whom Your Superman is gonna save the world. Superman Themed Birthday Party. A Superman party looks very excellent when decorated in red, yellow or blue and better if all three color is mixed used. You can very add black color for a comic book style appearance. Start with balloons which are an easy way to fill a room. Add blue , red and yellow color balloons to our Superman Kit. For the complete look i should sujjest you to use a combination of solid color balloons and our Superman Mylar balloons, too! Superman Themed Birthday Party. Cut out large comic book words such as POW , BAM etc . from the large cut piece of black cardboard or from the card stock. Put them inside white speech bubble shapes and tape to walls. You can do the same for the large “S” for superman. Cut out a large “S” by cutting off from the Cardboard and use tape or glue for pasting it to an upside down yellow triangle. 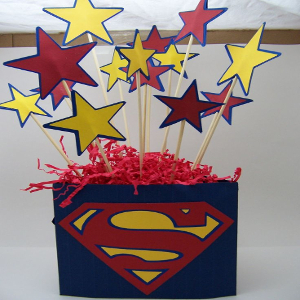 A Superman Pinatas filled with Superman party favors and candy can be both an activity and a decoration. Keep the food simple and use the red, yellow and blue color scheme in your food choices. Green jello moulds or jello cut into cubes to look like rocks or Kryptonite crystals. Superman Theme Party Decoration. Cookies with yellow and red icing in the shape of the Superman 1st letter or Use our recipe for making Sugar Cookie , shaped cookie cutters, and an assortment of colorful icing. Decorate the cookies before the party or use the cookies as an activity. Superman Theme Party Planner. Some other theme party Baby Shower theme , Ballerina theme , Beach theme and many more..